It’s the first of two back-to-back nights at the O2, with the Black Eyed Peas taking centre stage. While queuing for a bite to eat, an announcement was made over the tannoy that Cheryl Cole would be coming on in 15 mins. Seconds later, a girl rushed out, casually telling her friends that the supporting act was already on. Quick decision. Food or Cheryl? Sadly, food lost out, taking our seats just in time for the last few bars of Fight For Your Love. To be honest, every time I hear that song I can’t help but imagine that Rufus Hound is dancing to it. Cheryl Cole sang a few songs, but to be honest I’m not familiar with most of them. I’d recognised Parachute and 3 Words, the latter being a duet with will.i.am, although it did feel weird that he didn’t join her on stage, but then again it was the Black Eyed Peas opening night in London, so it made sense to stay backstage. From the moment the Black Eyed Peas transported themselves into the O2 Arena, it was obvious that this was going to be a spectacular gig. Let’s Get It Started kicked off the show, followed soon after by the sensational Rock That Body, Meet Me Halfway and Don’t Phunk With My Heart. A cool Freestyle rap by will.i.am and solo performances by Apl.de.ap and Taboo got the crowd going, as did Fergie with her performance of Glamorous. 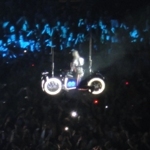 The Black Eyed Peas spared no expense in thrilling their audience with a spectacular show including a motorbike ride high above and across the O2. Up next with an i.am.robot DJ set was will.i.am, pumping out an eclectic array of tunes from American Boy, Thriller and Jump Around to Smells Like Teen Spirit, Sweet Child o’ Mine and Sweet Dreams. The Black Eyed Peas rocked the house with Don’t Lie, Shut Up, Pump It and Where Is The Love?, culminating into a superb finale of Boom Boom Pow and I’ve Got A Feeling. A fantastic show and so pleased I’d booked tickets to see The Black Eyed Peas again on the following day!